One of the most successful quarterbacks in college football history. In 2018, FCS All-America First Team, MVFC Offensive Player of the Year and Walter Payton Award Finalist (3rd). 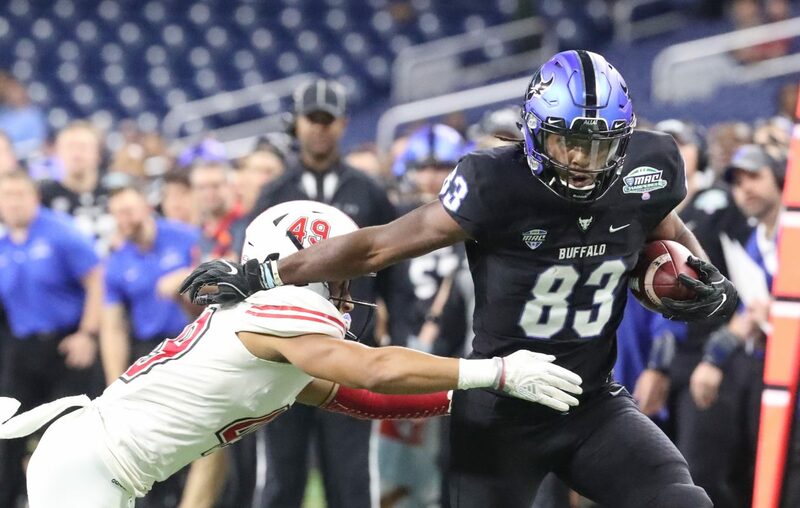 MVFC All-Academic First Team and three-time Team Captain (2016, 2017& 2018). All-time winningest quarterback in FCS history with 49 victories as a starter. Four-time FCS National Champion and two-time starter in Championship Game. Started 14 of 15 postseason games over career. Finished as Bisons’ career record holder for passing yards (8,693), passing touchdowns (88), total offense yards (11,216), yards per game (203.9), yards per play (7.97) and total touchdowns (129). MVFC career record holder for rushing yards (2,523) and rushing touchdowns (41) by a quarterback. Followed Carson Wentz at NDSU. At 6-foot-1 and 224 pounds, rhythm passer who played in a pro-style offense, which incorporated RPOs. Great mechanics and compact throwing motion. Good footwork and mobile field general. Sells play fakes with conviction. Maneuvers well in pocket: Steps up and establishes a throwing platform. Keeps eyes down field and throws a nice deep ball. Decisive progression reader: Scans entire field and can uncover third target. Gains rushing yards on designed runs and scrambles. Stupefying Senior Bowl week impressed scouts and onlookers. Stupendous Combine scores illuminated athletic ability. Average arm talent, and at times, struggles to throw into tight windows. Played against lower level of competition. Needs to improve accuracy and complete passes in the intermediate zones. Over the past two decades, Tony Romo, Joe Flacco, Jimmy Garopollo and Wentz all learned their craft at the FCS level. A pro-ready prospect who needs time to adjust to the speed of the game as a professional. A senior who materialized on the radar of scouts late in the season. In 2018, rushed for 995 yards and scored 12 touchdowns in nine games. Surpassed 100 yards four times, including a career-best 202 versus Florida State. Checkered job application: Arrest (marijuana and unlicensed hand gun), suspension (4 games), injuries and immaturity. At 5-foot-11 and 212 pounds, smooth and fluid ball carrier. Bulldozer who explodes through the hole. Good cutback ability complemented by adequate burst and quickness. Breaks tackles with combination of power and speed. Savvy runner between the tackles. Good patience to follow blocks and above average vision. Hits home runs. Late bloomer on campus: Only earned 99 carries first three seasons but netted 158 as a senior. Nicknamed “Juice Man” and energized teammates. One-speed long strider who runs upright. Brought down by first defender. Below average hands as a pass catcher and poor pass blocker. Does not transition well from catcher to runner. Character concerns may drop the former Notre Dame ball carrier down some team’s rankings. Impressive Senior Bowl week and displayed much better athletic ability than expected at Combine. One team likely overlooks red flags and spends a late-round draft pick on the Irish runner. In 2017, replaced Christian McCaffrey, one of most prolific runners in college football history. Named Doak Walker Award Winner, Lombardi Award Winner, Pac-12 Offensive Player of the year and unanimous All-American after rushing for 2,118 yards and scoring 19 touchdowns. Finished second in the Heisman Trophy voting behind Baker Mayfield. Decided to return to school despite ranked as a top prospect at the position. In 2018, Team Captain and All-Pac-12 honorable mention despite suffering a torn right ACL and rushing for less than 1,000 yards. Concluded Cardinals career as the all-time leader in yards per carry (6.8), fourth in rushing yards (3,866) and fourth in 100-yard rushing games (16). Majored in human biology and plans on attending medical school after football with a career goal of becoming a pediatrician. At 5-foot-9 and 200 pounds, a slasher with atypical agility, innate balance and inordinate instincts. Extremely elusive and marvelous second-level vision. Quick feet and bursts through seam. Virtuous hips to make swift cuts. Bigger than size indicates. Runs low and overpowers tacklers intermittently. Intelligence and mental toughness. Employed in numerous formations and positions: Single back, multiple runners, shotgun, and as a receiver. Slight frame. Needs to press the line of scrimmage with conviction. Not healthy either of the past two campaigns as the lead back. Lacks polish as a pass catcher. Not a physical pass protector and can be shoved around. Major red flags: Injuries and durability. Some scouting departments will take him off board. Most likely a rotation runner as a professional. Intriguing prospect from the Group of Five conferences. All-MAC First Team in 2017 and 2018. In 2017, paced MAC in receiving yards (1,356) and touchdowns (14) and in the FBS, finished sixth in yards and third in touchdowns. In past two seasons, logged back-to-back 1,000-yard campaigns on 133 catches and scored 25 touchdowns. JUCO transfer from Butler Community College (2014) and Western Community College (2015). Redshirted first season at Buffalo in 2016. Cousin of Houston DE Jadeveon Clowney. At 6-foot-2 and 209 pounds, tenacious competitor who plays larger than size indicates. Good size and strength ratio. Savvy athlete with very good body control. Physical receiver and fights through tackles. Very good at gaining yards after the catch. Employed all over the formation: Can play in the slot and on the outside. High football acumen. Strong hands. Locates ball in the air and makes over-the-shoulder catches. Corrales the ball in contested situations. Jumps defensive backs and high-points the ball. Willing, and eager, blocker but disengages too early and whiffs. Raw route runner and must improve technical skills. Lacks elite athleticism, juice, agility and flexibility and long speed. Does not easily separate at the line of scrimmage. Rounds corners instead of making sharp cuts in routes. Projects as a possession receiver as a professional. In Red Raiders’ history, chronicled one of the paramount seasons by a wide receiver with 88 receptions for 1,410 yards and nine touchdowns. Surpassed 100 yards receiving in six of 12 games, eclipsed 150 yards four times and recorded 23 plays of over 25 yards. Also, totaled a first down or touchdown on 64% (56) of catches. Established a single-game record with 261 yards against Houston. At 6-foot-4 and 206 pounds, lean frame with long arms and strong hands. Great body control and first-class ball skills. Versatile playmaker: Deployed inside, outside and in-line in the “Air Raid” attack. Good lateral movement and change-of-direction skills for a big athlete. Sneaky fast strider who is a good run-after-the catch artist. Ankle-twisting moves in the open field. Makes circus-like catches: One-handed snatches and jump-ball grabs. Prodigious at tracking the ball and easily high points passes. Employs leverage against opponents. Not overly physical nor a quick-twitch athlete. Does not always win contested passes despite size. Not explosive off the snap. Must improve route running and sporadically dropped passes. Perhaps, a one-year wonder? Can he beat press coverage? A high-ceiling prospect who likely needs a few seasons to blossom as a professional. 2018 and 2017 All-Mountain West Second Team. 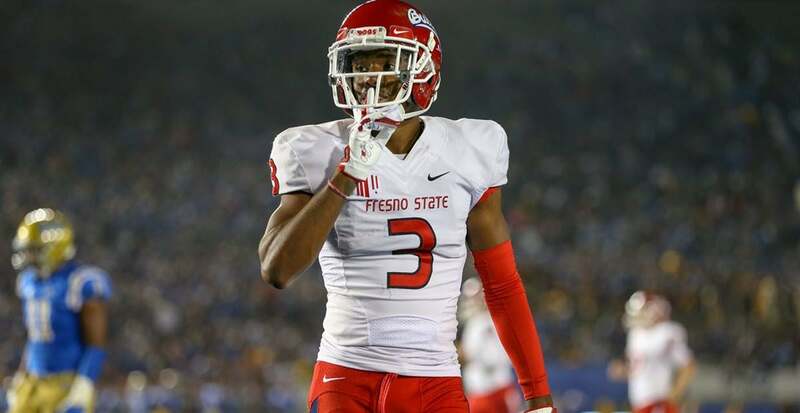 All-time Fresno State leader in receptions (275) and receiving yards (3,463). Paced team in catches, receiving yards and touchdowns for three straight seasons. Over the past two years, corralled 172 passes for 2,353 yards and scored 16 touchdowns while averaging 13.6 ypc. Attended same high school as former Bulldog and current Packer Davante Adams. Redshirt senior who started 50 games. At 6-foot-1 and 201 pounds, versatile playmaker with very good athleticism and body control. Natural hands and seems to catch everything: Routinely makes one-handed grabs. Employs hands to gain separation and plucks ball with confidence. Exemplifies technique and execution with hands. Smooth competitor and route runner. Tracks ball tremendously well. Powers through tackles. Possession receiver who disguises routes: Defensive backs must guess right or get beat. Makes precise cuts and uses double moves to get open. Good balance and toughness. Average burst and utilizes speed to the best of ability. Not a speedster or uber athlete. An underrated prospect who will earn a roster spot and be productive down the road. With his Masters in history and professional experience as an educator, John Laub is uniquely qualified to research, analyze and discover new insights and trends in college and professional football. Laub has played fantasy football for thirty years and published articles for FootballDiehards.com for well over 20 years. He won $10,000 in 1993, defeating nearly 15,000 owners, and published Audibles: Winning is Everything in the 1990s. He is co-host of the DFSDudes and CFF: On Campus PodCasts. He truly is The Gridiron Scholar.